This year’s county championships were the club’s most successful in well over a decade! At last year’s championships we came back with a total of 2 team medals and the last time the event was held at Hughenden we managed a total of 1 team and 2 individual medals. Yesterday we bagged a grand total of 8 medals (4 team and 4 individual). 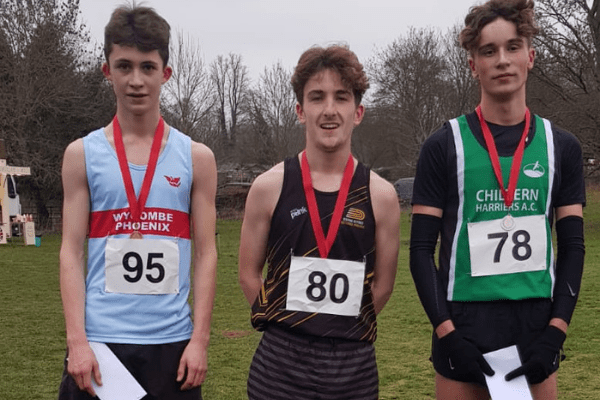 Jacob Sanderson was crowned County Champion in the U15 boys race to add to his track 3000m Championship Gold and thereby managing a track and cross country double in the same season. 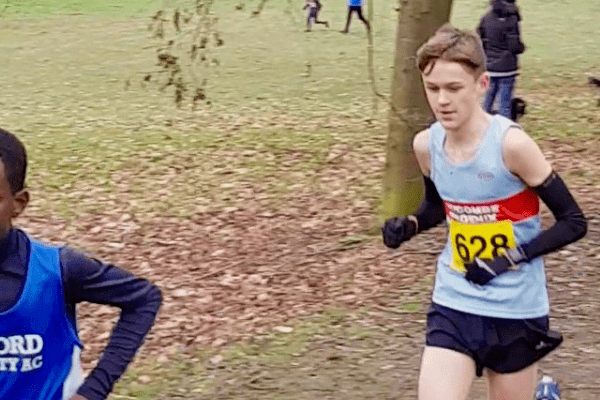 Myles Caddell continued his progression (based on hard work and consistency) to finish third in the U17 men’s race, coming away with a bronze medal and adding to his track 3000m bronze from the summer. 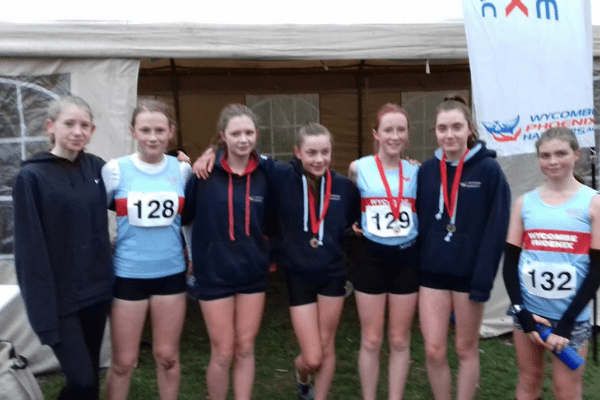 For the first time in many years we had a good number of junior athletes turning out, which resulted in team medals across the U13 and U15 age groups. The U13 girls team came away with Bronze, the winning team was made up of Thea Gray, Libby Sutton, Evie Burton and supported by Ellie Faulkner, Lyla Griffin, Amy Hogbin, Emma Caddell, Mae Burton, Georgie Larard, Chloe Fossel and Iris Cooper. 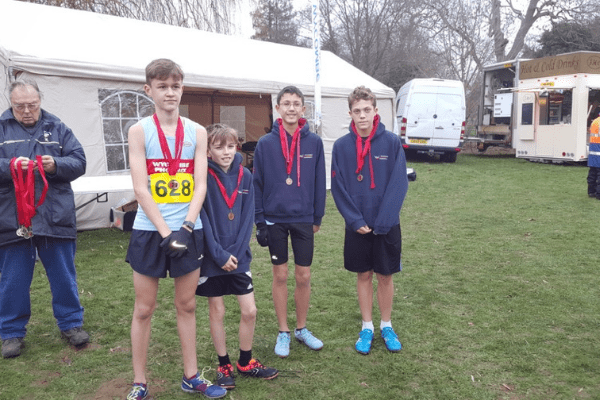 The U13 Boys race was a similar story with the team of Casper Chillingworth, Sam Sanderson, Freddie Higgins and Jai Burmi all coming away with bronze medals, with Ishi Burmi just finishing outside the medals. This is the best turnout in the club’s recent history and is a credit to the coaches and assistant coaches working with these age groups. The U15 Girls also had a record turnout, a total of 7 girls raced, with Olivia Brown, Ellen Cooper and Tilly Firth coming away with bronze medals. Supported by Maddy Wood, Mia Caddell, Bessie Chalmers and Sophie Thomas. Unfortunately we were a little down on numbers in the U17 age group due to a combination of illness and exams. In the U17 women Emily Whelan was our sole representative and ran bravely over two laps on a tough course. 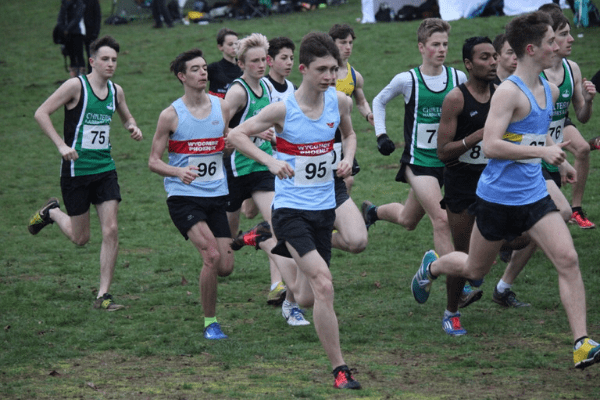 In the U17 men’s race, as well as Myles Caddell’s Bronze medal performance, it was good to see Luke Kempton making a return to racing after time out due to injury. For the first time in many years we also had senior teams finishing in top 3 positions. The senior men’s team of David Clark, Kieran Gilfedder, Sean Wilson, Frank Fulcher, Paul Gilbert and Peter Norris finished 3rd and the Vet Men’s team of Frank Fulcher, Paul Gilbert, Shaun Chillingworth and Mike Taylor came in 2nd. Frank Fulcher (silver) and Paul Gilbert (bronze) also won individual medals in their age groups. This year we were the hosting club and therefore responsible for much of the organisation. Special mention goes to Sally Delgado for her tireless efforts in organising the event and also to the parents and athletes from the club who volunteered to help on the day.